And so it was, that at the ripe old age of 32, despite not having the opportunity to vote in this general election, I attended my first political rally tonight. And an Opposition (as characterized in popular discourse, though all that means is that they're not the dominant party) political rally at that. 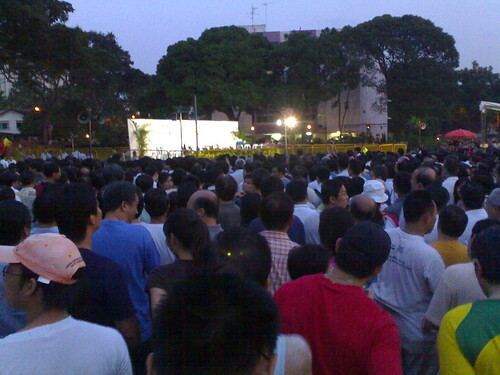 More precisely: the Workers' Party rally at Hougang Central. Because it was my very first political rally, I didn't have all the survival tips down pat. I knew from Yawning Bread's accounts of two recent rallies that the setup would likely be spartan and no-frills, i.e. bare grass patch, potentially muddy in the event of rain, packed with enthusiastic supporters. So BoKo and I were prepared to sweat it out if the crowd got too tight and armed with an umbrella if the weather turned. 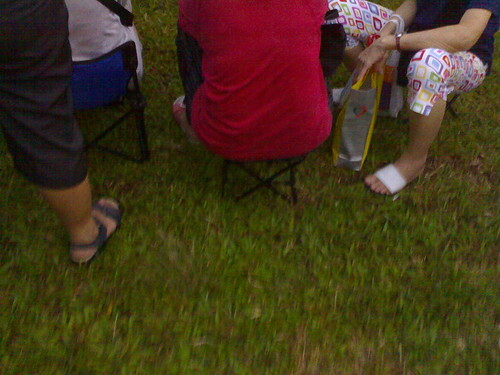 What I didn't know was that it would be smart, if one were planning to listen to the entire rally, to bring one's own chairs and refreshments. No wonder the vendors selling cold drinks, ice creams, fried fish balls and other snacks seemed to be doing a decent business even before the rally began. I didn't really have any expectations about what a rally would be like. I supposed there would be loud cheering from supporters (check), loud exhortations from candidates (check) and silent stares from the policemen on duty (check). What I didn't expect was the variety of languages that the candidates took turns to speak in (English, Mandarin, Hokkien, Tamil) and the rousing response to the speeches made in Hokkien and Mandarin. I have never felt like more of a monolingual minority: even though I could grasp the odd thread of what was spoken in Mandarin, I had to keep turning to BoKo for a more thorough translation. And I certainly didn't get any of the Hokkien slang or jokes that were keeping the crowd engaged. 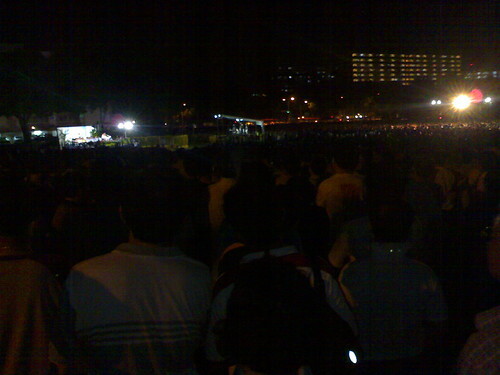 The other thing I didn't expect was the size of the crowd --- oh lord, the crowd. 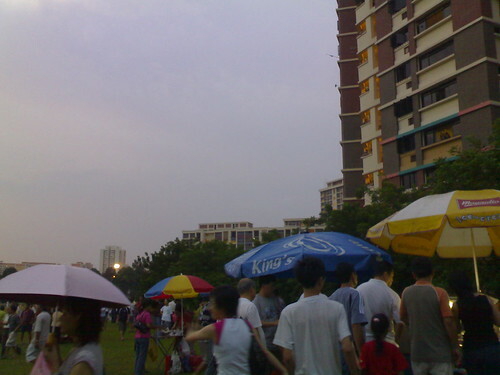 It was already decent-sized at 7 pm when we got there --- 4,000 or 5,000, we estimated --- but it swelled to fill almost the entire field (hemmed in by Hougang Central, Hougang Avenue 4 and Upper Serangoon Road, Jalan Naung and block 837). Our layman estimates: 10,000-20,000, all told. And they stayed, standing, even though most of them were unable to see the speakers and could only hear their speeches through the PA system, until the very last speech wrapped dutifully, in accordance with police regulations, at about 10 pm. But I think the money quote came from Workers' Party candidate Perry Tong when he pointed out that his party's manifesto spent four pages and 800 words dealing with healthcare issues and outlining specific policies, while the People's Action Party's manifesto had just forty sixty words to say about it. I haven't yet compared the manifestos to verify this, but that's on my to-do list for tomorrow for sure. 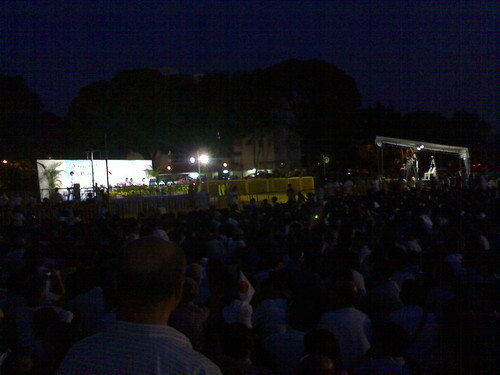 So that was my first rally: Huge crowds, fervent (though not quite roaring) support for the party. Old men who look like they might've attended their first political rally back in the '50s, standing alongside families with fidgeting teenaged children, standing alongside couples younger than me who have yet to start a family, standing alongside even younger people who are probably just old enough to vote this time around. Surprisingly few smokers, for a crowd this size. Residents watching and listening from the adjacent apartment buildings, the staircase landing on every floor dotted with their silhouettes. Young people carrying a "We love Sylvia" placard, that when flipped around read, "We love life, we love freedom". Whether or not you get to vote, whether or not you make it to a rally in the next week, find out a little more about what's what this election. All the political parties have published their manifestos on the web: the People's Action Party (PDF), the Singapore Democratic Alliance, the Singapore Democratic Party and the Workers' Party (links via a gecko's tale). Read. Think. Question. Debate. And --- if you get to --- vote. Lucky you! I was in that area but was dragged by budak in the opposite direction because he wanted to visit a fish shop! i was there too!i agree that the issues were "unsexy" but it was amazing to see the crowd and to hear people who really care about the country offer a new perspective. i must say i haven't been completely swayed by the depth of their arguments, but i am completely bought over by their resolve to present alternatives. hmm, what do you mean by 'unsexy'? i think it was a very popular issue with the crowd demographic. you'll notice for instance that there were less cheers for "we want a transparent govt and a free media" than for "we want the govt to remove GST for medicine! ", which got everyone clapping and cheering like mad. oh yes, about the manifesto thing, i think i remember perry tong saying 60 words, not 40 -- i just checked the PAP manifesto, the word count is 57.
you got to see the stage!! lucky bugger :( i was part of the crowd huddling around the loudspeaker instead, being deafened and feeling vaguely foolish for looking in the same direction as everyone else but seeing nothing except more people. The licensing of art will be taken out of government control and given to an independent body with representation from the arts community. Check out this funny parody about the recent James Gomez Saga.